Figs are subtropical trees but they will adapt to different conditions. Immigrants brought fig trees to the northern part of United States and they found ways to grew it successfully in cold climate. 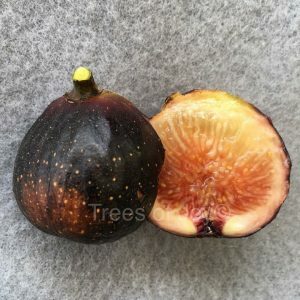 Here are a few things that should be considered when planting figs in your garden, either in cold or a subtropical climate. Figs can be grown in pots or in ground. Most of the varieties we carry have proved to be successful in our cold climate. When planted in ground give the fig the warmest, sunniest spot in the yard usually near a wall facing south is the ideal spot. 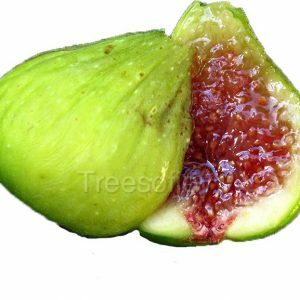 Avoid planting in soggy wet soil; any other soil is fine for outside figs. Applying a layer of mulch will help small tree develop stronger roots by keeping the weeds away. Fig trees are native to the Mediterranean climate, but they will survive colder winter with some care. Low temperatures in winter of around 13° F can damage above ground growth of a fig, young growth is usually more sensitive. The older the growth the more hardy it is. 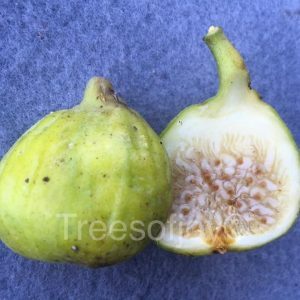 Figs should be planted in the most protected areas sheltered from north winds. If a fig is killed to the ground it usually will come back up when weather warms up. When planting against a structure you create a micro climate that benefits the figs in winter. There are many methods to covering figs in winter. Small trees with small diameter can be bent to the ground and covered with soil. Older trees, you can wrap them with an old carpet, then wrapped with a plastic tarp. Avoid clear or black plastic since this causes heat build-up. If you have a problem with field mice, a good deterrent is moth balls. Place moth balls around the trunk of the tree before you wrap it. If the tree suffers from winter kill, remove the dead wood. Once new growth sprouts from the ground, keep about 3 sprouts that are spread out and remove all others. These will be your main trunks. This will allow enough sun to reach between them. In some varieties these trunks will bear figs the same year. Potted fig trees are a great option for northern climate and for those with limited space. Use a good draining soil mix for containers. A basic mixture you can use is: 2 part pine bark mini nuggets, 2 part professional potting mix, 1 part perlite, 1 part coarse sand, then mix ingredients together ell. 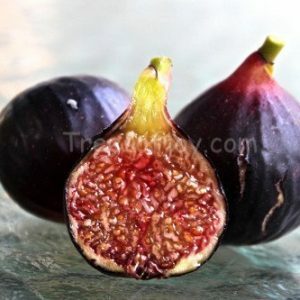 A good size for a containerized fig is about 15-20 gallons. Once they’re in that permanent size, repotting is necessary at least every 2- 3 years. Repotting is best done in late winter or early spring. Cut up to half of the root system; also prune the branches at the same time to keep the tree in balance between roots and branches. In winter move potted figs into a cold storage such as a garage or a barn after leaf fall. Temperatures in storage should not be allowed to fall below 20 degrees. Only water them when they’re completely dry about once a month for small trees while in storage. Large trees require little watering while dormant. Move potted fig trees outside as the weather gets warmer. Place them in a sunny spot. Watch the soil carefully, and don’t allow it to dry, which may cause the fruit to drop. In extreme heat they benefit from afternoon sun. Fertilize potted tree with a slow release fertilizer. They respond well to fertilizer with higher nitrogen level with ratio of 3-1-2. If applying slow release fertilizer that feeds for more than 3 months, only fertilize once in the spring by applying it to the top 2 inches, or mix with your soil mixture while repotting. Bass: Do you advise we start off with a 15-20 gallon pot, or start off with a small pot and upgrade gradually over several seasons? It depends on the root system of the plant and the type of soil. You can place 1 gallon plants into 3 gallon pots with no issues, if you are planning to place it into a large container such as 15-20 gallons, make sure the soil has good drainage so it doesn’t retain water and remain wet which can lead to root rot. We live in York PA and bought fig trees from you last year. We have a “Ronde de Bordeaux” and a “Verte”. We planted them in the Spring of 2016 in the ground along a South facing wall and they are doing great. The trees are almost 10 feet tall and bear a lot of fruit. – Now that they are that tall, how do I prune them and when? Last year, I kept them at 4 feet high and wrapped them up. – How do you winterize them when they are that tall? Hello Bruno, I’m glad these are doing well for you. Verte is a late ripening type but once the tree is established it should ripen them earlier, as these should be ripening end of September by the latest in our area. if it’s a small tree when it was planted it’s normal that they’ll take some time to get established. I would pruning to about 6 feet and tie them up as you normal overwinter them before. they’ll do fine. there are several ways to do it. Good luck. Black Madeira is a very slow grower and seems more difficult to propagate. I will have some available soon. Bass, I bought one of your Koura Black figs and have a south facing wall I’d like to plant it in front of. How far away from the wall should I plant it? I’m not sure how wide the tree will get or should I always prune it to a certain width or height? Is this one of the varieties that is ok in our zone 6 with winter protection? I have a small conservatory but things get buggy in there. Thanks for any info.! Hello, South facing well should work well. I haven’t trialed it in ground over winter yet. Let me know how well it did for you. Can you tell me fruit shown in the site below is available in the US, if so from where i can buy the plant? Hello, we have some available in the near future.